My husband's parents were married in 1957, after meeting by complete happenstance. They were married in a church that's a mile or so from where we live now, and I think of that every time I drive by there. She wore a beautiful ballet length dress, as was the style that year. Isn't it beautiful? Here's a closeup of the bodice. I love the collar. The post-wedding photo. Don't they look amazing? And for those of you who look at vintage clothing as just being "old clothes," here's how you can work vintage the right way. Dan's sister wore her mom's 1957 wedding dress at her own wedding, in 1985. Beautiful, yes? I think so. What does it take to make a wedding dress for a future queen? Well, if you are the future Queen Elizabeth II, it took Norman Hartnell. And he designed dresses for just about every woman who had a part in the 1947 wedding, too. He designed the dress in less than three months, finding his inspiration in a Botticelli painting. He aspired to create a pearly garden, going so far as to send his manager to the U.S for the pearls. When returning to his homeland, customs asked if he had anything to declare. Imagine being there when he raised his collar, "bent forward mysteriously and answered in a lowered tone: 'Yes, ten thousand pearls, for the wedding dress of Princess Elizabeth.'" I'd imagine the customs agent was taken somewhat aback whilst collecting duty on them. And then there was the near scandal of the worms. The entire dress, almost came into question at one point. Mr. Hartnell wasn't able to use silk from the Queen's choice of silk, but when he chose another source, questions arose as to the origins of the silkworms. An outcry arose when some fine citizens said that the silkworms were (gasp) Italian, or even worse, Japanese. Imagine the scandal in post WWII England, with the thought of this. A genealogy of the worms ensued, at which point it was ascertained that they were, indeed, Chinese worms, and were thus found to be acceptable. The monarchy was saved. Mr Hartnell also designed the bridesmaids' dresses, cutting them out on the floor of his workshop, as well as the dress for Queen Elizabeth (the Queen Mother). They covered the windows of the workshop, first with whitewash, then with muslin, to try to keep anyone from seeing the design and copying it before the wedding. On the day of the wedding, the Princess' bouquet briefly went missing, but in the end, the wedding took place, and history was made. Want to see more photos of the wedding trousseau? Click here. For other royal wedding eye candy from years past, click here. Perhaps you remember me mentioning the McCall's 8332 pattern, in a style created by Oleg Cassini for Jacqueline Kennedy, but without the attribution? It's adorable, and difficult to find (though I have one in my store, hint hint). Today, my dear compadre Tina, from What-I-Found Sewing Patterns, sent me an early birthday present. (Go buy something from her. Now. She is the best!) I arrived home to an unexpected package, and literally screamed in delight when I opened it -- a 1967 Spadea pattern catalog, full of Ceil Chapman, Jo Copeland, Suzy Perette, Duchess of Windsor, and more designers. It's a wonderful thing to behold. Both are a bit of "business in the front, party in the back," aren't they? And cute, cute, cute, yes? And now, enjoy the Fall/Winter Dior Haute Couture collection, by John Galliano. Beautiful! You may have heard of Wasps. I'm not talking about the insect kind. I'm talking about THE Wasp, as in Wasp waist and the like. Interestingly, one of the definitions wordnik uses for wasp is "Figuratively, a person characterized by ill nature, petulance, peevishness, irritability, or petty malignity." Look up waspish, and you'll find that it means "Like a wasp in any way. Having a very slender waist, like the petiole of a wasp's abdomen; wasp-waisted; tight-laced." I shall explain the rules of the Wasp's summer home, as defined by John Fairchild, former editor of Women's Wear Daily, in his book "Chic Savages." Wasps don't like to spend money. Their summer home is not restored to its former greatness, because that would cost money. It's more likely to look like it's going to blow over at the slightest breeze. Wasp's houses are clapboard and cedar shingles, preferably with columns. Wasps love columns. No big or shiny cars. And dirt roads, for authenticity. Wasps love garage apartments but HATE picture windows. They "would rather go without a view and even without light than have a picture window." Why? I have no idea. Wasps love weather vanes. They apparently add to the ambience of "this is a summer home." I wonder if the Kennedys have weather vanes? Wasps are, of course, concerned with property lines, meaning that they won't let a tree branch extend over their property line. Wasps are, in general, very caught up in borders of all kinds, to the extent of not allowing someone to walk to the public beach if they have to infringe on their property to get there. Territorial? Yes! They will, however, rent their summer home. For big bucks. Wasps will picnic on the beach. They will not picnic in the yard. At the beach, Wasps will sit and stare, for long periods. They do not walk. Long walks confuse them. Wasps are not concerned with the sun. Sunburn gives them a fine, weathered look, probably not unlike their summer homes. The pain of a sunburn is cured by a cocktail. "Wasp women don't seem to age: they just weather from the sun, sea and drink." The do not, however, wear bikinis, and the men do not, under any circumstances, wear a Speedo. Ever. Hats are never worn for fashion at the summer home. They are worn to shield one's face from the sun only. Wasps love anything English, and bicycles are no exception. They will leave said bicycle out in the rain, so it gets the proper weathered look like their house and their face. Do you see a trend here? Wasps also think that their family has been in New England for generations. Even if they haven't. Wasps love Ralph Lauren. It makes them feel as though they are at the English countryside. Back in town, they will dine at Le Cirque or at the club, probably on chicken salad, with perfect posture, to keep that waspish waist intact. 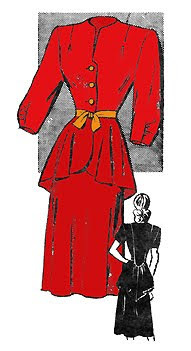 Pattern, from the Vintage Fashion Library. Click the image to buy.